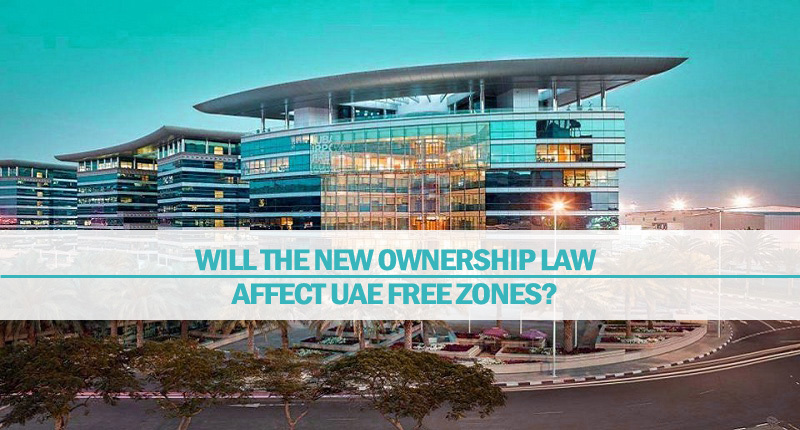 Will The New Ownership Law Affect UAE Free Zones? UAE is trying its best to minimize its reliance on oil & gas sector which is becoming more and more unpredictable with the passage of time. It is the reason that government is passing new laws continuously in order to assist the growth of other sectors. Even before the oil crisis of 2014, business was an important sector in the country and its importance has increased several folds since then. It is the reason that the government is taking new measures to increase the scope of this sector. Couple of months ago, UAE took a revolutionary step in this regard by allowing 100% foreign ownership to businesses in mainland and 10 year visa for investors and professionals. Previously, 100% ownership was only allowed in free zones while most of the businesses of foreign investors are established in UAE mainland were only allowed 49% ownership (51% ownership to local Emirati sponsor). This new law was warmly welcomed by the business community as it would relieve their problems and provide them easiness to do business freely without facing problems associated with local sponsors. But it also produces few concerns about the future of free zones. There are benefits and shortcomings in both types of businesses in free zones and mainland. But if the most important advantage of free zones will now also be available to mainland businesses, then there is little reason for survival of around 45 UAE free zones. But this concern is merely due to unawareness about details of the decree and also about other special advantages provided by free zones that are still not available in mainland. These are just few of many advantages specifically available in free zones and these will attract companies and professionals to choose free zones for their businesses instead of mainland business areas. Therefore, we can easily understand after knowing these points that free zones will continue to operate in different parts of UAE after the passing of new decree regarding 100% ownership for businesses in UAE mainland. It is important to note that UAE is getting lots of benefits through these free zones. DMCC (Dubai Multi Commodities Centre) has achieved status of world’s best free zone three years in a row while UAE is getting billions of dollars of exports every year through its free zones. In these circumstances, it is unwise for UAE to take measures that would endanger the existence of free zones. Instead, we can expect emergence of new free zones in UAE in future due to their potential advantages to both foreign investors and country. Therefore, both free zones and mainland in UAE provide unique and special advantages to various businesses and you can choose both of them according to your preferences. If you want to establish your business in any UAE free zone or mainland, you can easily do so by taking services of Riz & Mona Consultancy. We are specialist in setting up all types of businesses in UAE mainland and also in any of the 45 free zones in UAE.